Support Our Parks by Showing Pride in Wichita! The Wichita Parks Foundation is proud to kick off the “Plates for Parks” campaign to support our Wichita parks. The license plates, similar to those currently available for state universities and other organizations & interest groups, will prominently feature the recognizable Wichita flag. A $50 annual royalty fee for the new license plate will go directly to the Wichita Parks Foundation. Below you can find information about the new Plates for Parks program and what it’s all about. For program questions, please feel free to email plates@wichitaparksfoundation.org. You can also call the Foundation at 316-512-7525. Please note that we are a volunteer organization, so it may take up to a day to respond to your calls or emails. For information about tag renewals and where to buy the tag, please visit the Sedgwick County Tag office web site. Statewide, visit the Department of Revenue Division of Vehicles web site to find your local tag office. What is Plates for Parks? The Wichita Parks Foundation was presented with a unique fundraising idea after discussion with Wichita City Councilman Bryan Frye and his staff. A long-time advocate of the city’s park system and the Foundation’s mission, Councilman Frye approached the Foundation with the idea of creating a custom license plate which could provide funding for future park projects and programs in the city. The Wichita flag as the centerpiece of the license plate was a natural fit because of its popularity and representation of the pride in our city. Thus, the Plates for Parks program was born. Artwork for the new license plate that will benefit the Wichita Parks Foundation. 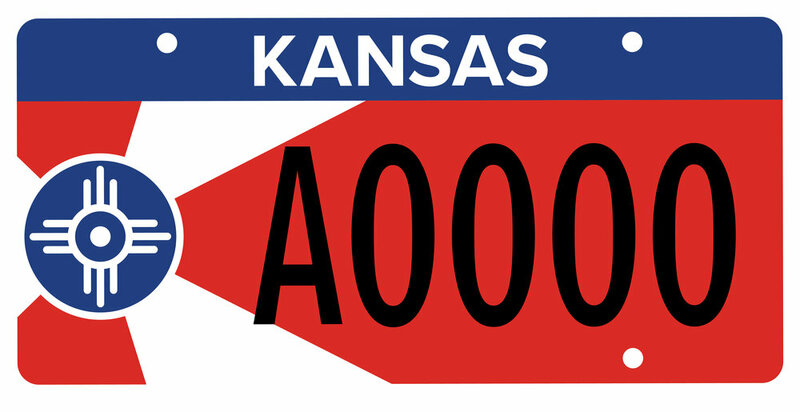 The plate was authorized by the State legislature in April 2018. The bill, sponsored by Wichita Senator Oletha Faust- Goudeau and supported by the Wichita legislative delegation, will become law in July 2018. Based on that schedule, the first plates will be issued at county tag offices on Janaury 1, 2019. When the bill was introduced, as a demonstration of support, the Wichita Parks Foundation needed to gather commitments from 500 residents who pledge to buy the plate when available in 2019. Within weeks of the announcement, the Foundation had pledges from local companies, such as Cornejo Construction, Hutton Construction and Metro Courier, to purchase plates for their fleet vehicles. What will Plates for Parks Support? The $50 annual royalty fee for the license plates will go to the Wichita Parks Foundation and will support improvements in our parks. On an annual basis, our board will work with Park & Recreation Department staff to develop a list of facility needs and projects to support. This schedule is based on information found on the Sedgwick County Tag Office web site. How do I get the new license plate? Go to your local county tag office to renew your tags as you normally do. When there, let them know you’re interested in the new Wichita Parks Foundation or “Wichita flag” plate. Please note, you will need to surrender your current tag at that time and you will be issued a temporary tag. Your new tag will be mailed to you within a few weeks from the State. What does the plate cost? The donation associated with this tag is $50, plus a one-time state production charge of approximately $48. So your first year cost will be your normal vehicle registration fee + $50 donation + $48 production charge (approx.). For future renewals, you will not pay that production charge. Do I need to live in Wichita to buy this tag? No! In fact, we’d love to have Kansans from border-to-border buy this plate! You can live anywhere in Kansas and buy the tag. It’s a great design and will show off your pride in Wichita, our unique flag, and your support of parks and recreation. Is the cost tax deductible? Yes, but only the $50 donation is tax deductible. What will the donation support? Your $50 donation will support future park facility projects in Wichita. Our board of directors will work with the park and Recreation Department annually to determine what projects will be supported. What do I do when I need to renew this tag? Initial purchase of this tag will need to be done in-person at the county tag office. However, as long as you are not making significant changes (new vehicle, etc. ), future renewals can be done by mail or online based on instructions found in your renewal notice. Are these plates available for motorcycles or trailers? Unfortunately, these tags are not available for motorcycles or trailers at this time. Are disabled parking plates available? Unfortunately, disabled parking tags featuring the Wichita flag are not available at this time. You can, however, purchase this plate and obtain a disabled placard, following instructions provided by your county tag office. Can I personalize the plate? These plates cannot be personalized at this time.